FOOTBALL–Uganda Cranes defence was finally breached after four competitive World Cup qualifying games and the team will rue the defence lapse that gifted Egypt that early strike. Until the sixth minute of the match in Port Alexandria Uganda were the only footballing nation in the world yet to concede a goal this campaign and arrived in Egypt on the back of a strong showing that saw them shock the record African champions in Kampala. Interim coach Moses Basena set his team out with the same starting XI that smothered Egypt in Kampala six days ago and the design appeared to be that for frustrating the Pharaohs with their pacy attacking football and striking when opportunities knocked. But all this changed in the sixth minute and Uganda had to keep the Egyptians more active than raindrops all through the game as the hosts defended with every leg and muscle in their body to keep their lone goal lead. Liverpool forward Muhamed Salah, who was kept at bay in Kampala, was the man to haunt Ugandans, lashing onto Abdallah Al-Said’s lobbed pass to find the back of the net on the rebound after his initial shot was saved by reigning African-based player of the year Dennis Onyango. Egypt took the initiative straight after the goal, creating the better chances one of which required a triple save from Onyango to deny both Al-Said and Ramadan Sobhi. Uganda’s only chance in the first half was wasted by KCCA FC striker Derrick Nsibambi when he failed to direct a free header goalwards from a Nicholas Wadada cross. Basena had kept faith in the same team despite some ineffective showing by some in Kampala, particularly Nsibambi who has struggled to find the right tonic for a Number 9. Nsibambi was in the team that played CHAN qualifiers against Rwanda, including ‘that’ match in Kigali that gave Cranes some goosebumps. 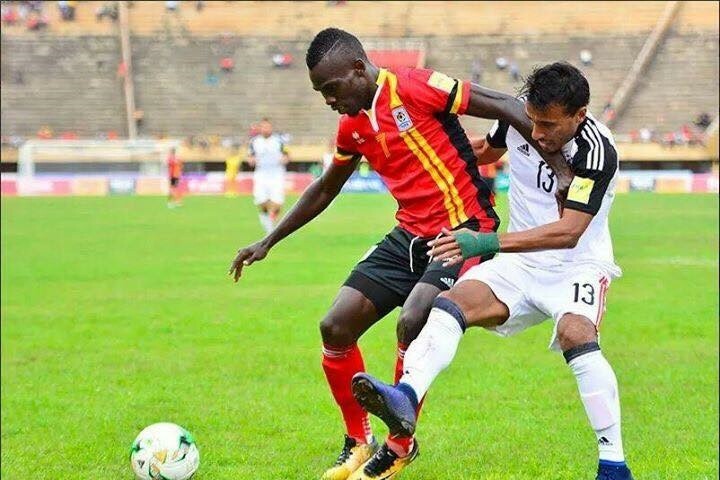 Basena made a substitution at the start of the second half with Romanian-based William Kizito Luwaga replacing the ineffective Joseph Ochaya and it proved to be worthwhile as Luwaga consistently troubled the Egyptian defence. Despite the immense pressure and ample possession, Uganda couldn’t create enough goal scoring chances with the only notable one being Derrick Nsibambi’s header that bounced off Ahmed Hegazi before Egyptian legendary goalkeeper Essam El-Hadary gathered the rest. Egypt missed several chances to pull clear and in the second half with Cranes right back clearing off the line from Muhmoud Hassan’s effort and Onyango diving low to save Salah’s curling shot. But the Egyptians will be contented with maximum points going into the last two rounds in October and November. The victory saw Egypt leapfrog Uganda on the log with nine points, two ahead the Cranes. Earlier, perennial African representatives at the world cup Ghana thrashed Congo Brazzaville 5-1 to maintain third spot in the group with Atletico Madrid midfielder Thomas Party grabbing a hat trick. There will be calculators handy in Group E where giants Egypt and Ghana, as well as Uganda, all have the single World Cup spot to play for. Uganda still has to host Ghana and travel to Brazzaville while Egypt travels to Ghana and hosts Congo. The fixtures mean Ghana, who hours earlier thumped Congo 5-1 away in Brazzaville, are back in the loop. Uganda’s next game is at home to Ghana on October 7, while Egypt host Congo Brazzavile the following day. The final round of games in group E will see Uganda travailing to Brazzaville on November 6 as Ghana entertain the Pharaohs in Kumasi on the same day. Milton Karisa for Derrick Nsibambi.